The collage is created from wall paper samples, reproduction prints of my original Intaglio prints and home made sculptured paper. The moon is created from a solar plate etching to transfer and print Beethoven’s hand written sheet music. 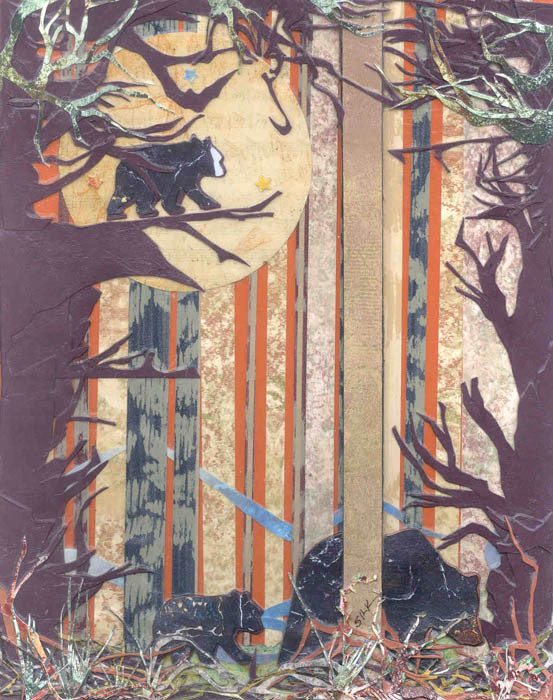 I utilized the wall paper to create the mid-ground and background of the composition, in the formations that represent tree trunks, while the reproduction prints were cut into a formation that represents branches and the bears. I added the bears and tree branches and thickets in such an arrangement to encourage the viewer‘s eye to move throughout the composition while creating more visual interest and texture to the composition. I decided to use a music term for my title because I often incorporate sheet music when creating original Intaglio prints that are incorporate into my collages and other artwork. I also find that the music terminology can best reflect the feeling of mood of the artwork.